Rockingham is launching a new track day experience which offers drivers the chance to drive three of its circuits in one day - unique to the Northamptonshire circuit. Unique to the Northamptonshire circuit, the adrenaline-fuelled track day, is being launched on Saturday, March 24, and offers participants one of the best priced track day experiences on the market. The track day not only incorporate the 1.94-mile International Super Sportscar Circuit (ISSC) with its technically challenging infield section, but also offers sessions on both Rockingham’s banked-oval and its state-of-the-art Wet Grip area. All three track configurations offer a total unique experience – it’s all about speed on Europe’s fastest motor racing circuit and the UK’s only banked-oval; the Wet Grip hones your handling skills on its low grip road surface while the ISSC will perfect overall technique. Rockingham Events Co-ordinator, Will Thomas, said: “Track days are popular at all circuits, however we wanted to offer a product which is totally unique at Rockingham and enable drivers to get the most from their experience. Whether a complete novice or seasoned veteran, participants will receive a full safety briefing, covering everything from rules of the event, through to car preparation, driving techniques, circuit information and familiarisation laps. One of Rockingham’s experienced instructors will be on hand throughout the event to provide the lowdown on the best racing lines and techniques before participants put theory into practice on track. The track day will operate as an open pit lane, which offers participants the flexibility to drive the circuit as much as they would please. The event will run from 9am to 5pm and includes full medical and safety cover and costs just £195. There is the option to bring one additional driver free of charge – providing the opportunity to share both the experience as well as the cost. There is also a special discount rate available to car club members when booking as a group. Pit garages, one-to-one tuition and helmet hire is also available at an additional cost, for more information contact Will Thomas on 01536 270143. 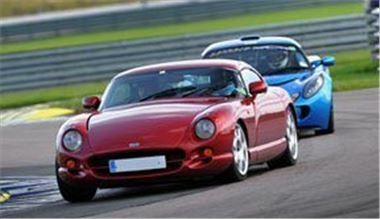 Alternatively places can be booked on-line at www.rockingham.co.uk. Rockingham has also launched taster sessions which are an ideal opportunity for those drivers to sample and experience what a track day is like. The 60-minute sessions, which provides around 20 minutes of real track time on the ISSC, free helmet hire and a full safety briefing, cost just £30 and are held during the lunch break. After sampling the track day drivers decide to take part in a full day, Rockingham will deduct the cost of the taster session from the price.